I made some changes at the beginning of the year, but had not made any official public announcements until now. At the end of December ’17, I resigned from my sales job at another bindery I had been working with and joined Marathon Press as Book Publishing Manager/VP Product Development. I had been both a client and a vendor to Marathon for several years and with their significant equipment investments in bindery and other technology recently, we decided it was time to join forces. My side business here, Design Bindery complements and works with Marathon as well as a number of other companies in many capacities. 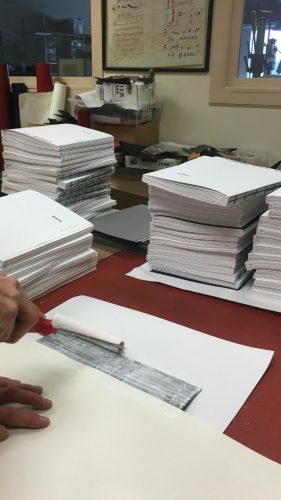 For the past few years, Design Bindery has been rather quietly doing turned edge specialty case making, Wire-o and Smyth sewn binding, product development, prototyping and boxmaking services for a small handful of clients. We also used the site to launch several of our own blank journal and notebook creations: Livraison.US, HolyCowJournals.com and more on the way. From that beginning, other brands and organizations approached us for special projects. One thing just lead to another, some intentionally planned and some not. So it all seems rather fitting that today, April Fools Day 2018, I announce that we have now moved out of the deep dark shadows of the anonymous internet (+ my basement) and into our “live, in person” office/shop location, the “Classroom” at 1414 South Street right next to my friends Kevin and Christopher. I’ve been working from this location for a long time actually, but now it’s “official”. Work underway in the Classroom! Only a fool would carry on in this business they say!! I know, I get it and I’ll wear that claim like a badge of honor! I’m not old — just 22 with 36 years of experience! I’ll never claim to be an expert on this stuff, because everyday we are learning something new. I love my job. Getting paid to do this stuff is icing on the cake! I’m involved in providing everything from product development, print/bind production and visual communication related solutions for non profits, e-commerce (photobook and yearbook) companies, design firms, stationery/art/supply distributors, interior design/architecture/engineering firms, museums/fine arts and book publishers to name a few. The majority of my job today revolves around harnessing technology and work flows for scalability while embedding craftsmanship and old world bookbinding techniques into tangible end products. One thing I love getting asked to do is to create prototypes for a potential project. Consider Design Bindery your book binding/stationery product short order cook. Have an idea? Let us whip up a sample to get started!! Yes, it’s all been said before, but by just jumping in and making a prototype of the product as quickly and as early in the creative process as possible, you can avoid so many potential pitfalls. Almost without a doubt, any complex project will change beyond the initial specifications given to us by most customers. Allow us to review the specifications and propose any potential changes. Make an appointment to stop by and work out details in person. 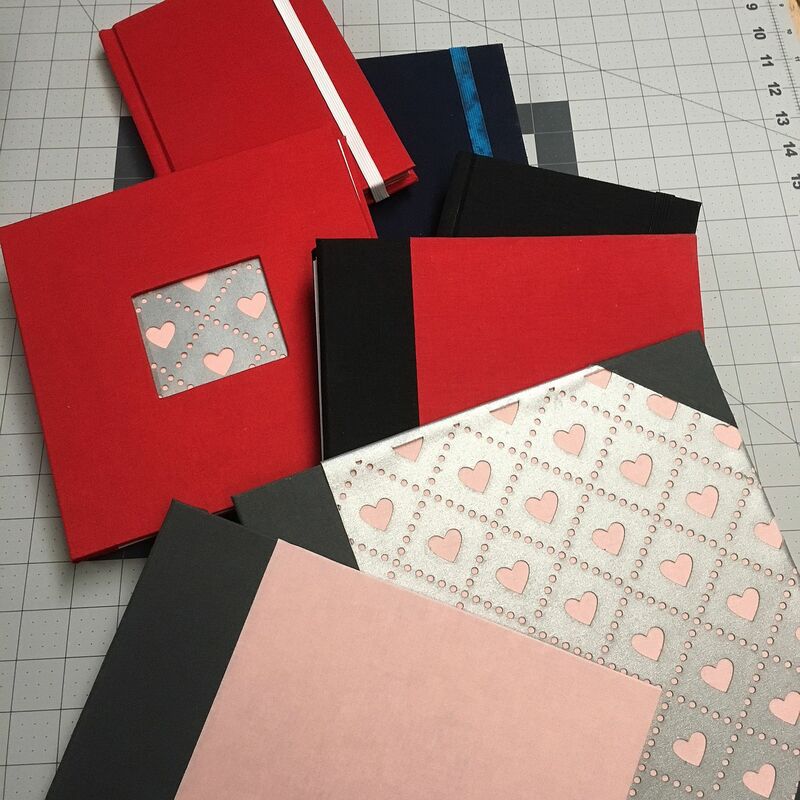 At 1414 South, we have assorted bindery and foil stamping equipment with lot’s of book cloth and cover materials, paper samples, leathers, and decorative papers and more. Stopping in for a consultation can jump start the project and set you well on the way towards success. On of my favorite features of the Classroom at 1414 South is the east wall, big gigantic whiteboard. When mapping out complex projects, such as photobook program implementations, this is a great spot to work things out. In providing personalized photobook solutions, we are working with several 3rd party software programs depending on client needs and objectives. We have turn key entry level solutions on up to serious enterprise level options for yearbooks, photobooks, journals and photo gifts. Optimal developmental discussion timeframe for these services are from February through July. Change is Good! Looking for something fresh and new? We are working on new product formats for photobooks, calendars, planners, photo albums, journals, and other gift related stationery items. Do you have an idea you’d want to discuss? Give me a call and set up an appointment to come on down!